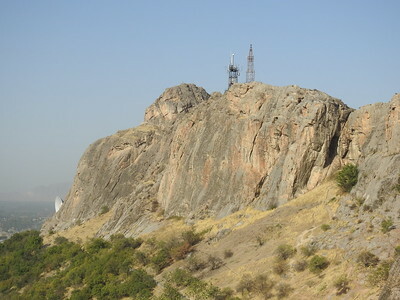 Sulaiman-Too Sacred Mountain is an Islamic and pre-Islamic sacred mountain. The mountain has a height of ca. 200m, and overshadows the city of Osh. Site visited April 2014. Osh was the last stop on my tour in Kazakhstan and Kyrgyzstan. In Osh I wanted to see what the Sulaiman-Too or Sulayman Mountain is all about. In retrospect, one of the most memorable things on this whole tour was the actual journey from Bishkek to Osh. It is also one of my fondest travel memories. In Bishkek I hopped on a Osh bound marshrutka. At first I waited for two hours for minivan to get full. The driver told that the journey would last nine hours but it ended to be an excruciating 13 hours. There were stunning views when we drove through the passes and up to the mountains. It was exiting to travel with six Kyrgyz who didn't share any common language with me. Along the road we stopped in some restaurants and also in one home. In the middle of the night the driver played music on car stereo so loud that I couldn’t sleep at all. But the music didn’t seem to bother a Kyrgyz granny who snored on the front seat. After a sleepless night it was a relief when I saw Sulaiman-Too in the horizon at six o’clock in the morning. I had one whole day in Osh and that was a good one. Despite of being somewhat Sovietized, Osh is a city with a real Central Asian feel with its lively atmosphere and bustling bazaars. 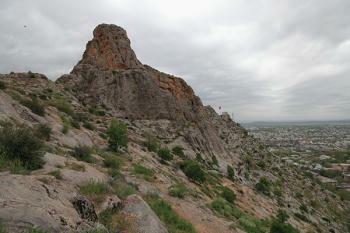 Sacred Mountain is the centerpiece of this old Silk Road city. It is very impressive looking from the long distance because the surrounding areas of Fergana Valley are quite flat. You can see the mountain almost everywhere in Osh. It was really nice to walk slowly on a network of traditional pilgrim paths. The mountain offers nice views to the roofs of Osh. There were lots of local people walking around and enjoying the sceneries. There were also women who ascend to the mountain in order to get pregnant and give birth to healthy children. I spent three hours wandering around the mountain. The mountain is surrounded by muslim cemeteries. In Sulaiman-Too there are totally five peaks. On the easternmost peak there is a small mosque called Babur’s house. The original building from 16th century has been destroyed in the 1960s by Soviet administration and rebuilt in the 80s. On the eastern base there are two other old and renovated mosques. On the south side there is a huge new mosque. Numerous caves seemed to be a popular hiding places for local young couples. In many places you can see rock carvings, both old petroglyphs and also newer ones from the Soviet times. One thing that disturbed me was the museum which was carved actually inside the mountain. It was weird to see that Soviet style concrete arch sticking out from the rock. In my opinion it reduces the authenticity of the site. Otherwise the small museum was OK and worth a short visit. In all, Sulaiman-Too is one of few worth noticing cultural sites in Kyrgyzstan, the country which is better known for its natural sights. I found visiting this site very enjoyable and it was a nice ending to my tour in Central Asia. Visited during a sunny day in April. The site is located in city Osh not far from the border with Uzbekistan. The site in fact are five linked hills in the middle of the city. The city is located in a flat area so the Sulaiman-too is visible from far away. The hills itself are quite steep, so you have to climb a bit. Beneath the hill is a huge mosque and an Islamic cemetery. On the top of the hill there is a small mosque linked to first Mughal - Babur. The petroglyphs are in danger by the people who are covering them by graffiti. There are various caves, which can be visited. I visited two museums in site - both are interesting, majority of the descriptions are in russian. It was a nice experience to visit the site, as it is a living site with full of pilgrims or people seeking healing. I enjoyed the stay, as well to see the city of Osh with its bazaar. WHC recommends to complete management plan and protection, extend the buffer zone and put in place a tourism strategy.